The Hydro GritCleanse™ is a fluidized bed grit washing system that significantly reduces volatile solids (VS) content to produce cleaner, drier grit. Cutting VS levels in wastewater grit reduces weight, volume, and water content—which significantly reduces odor issues and saves you money on disposal. Brought to you by the pioneers in fine grit removal, the Hydro GritCleanse™ retains 95% of all grit 106 micron and larger and outputs washed grit with less than 5% VS and is the only fluidized bed grit washing technology that can be offered with our industry-leading performance guarantee. The Hydro GritCleanse™ is a fluidized bed grit washing system that significantly reduces volatile solids (VS) content to produce cleaner, drier wastewater grit—reducing weight, volume, and water content to reduce odor issues and reduce landfill disposal costs. The Hydro GritCleanse™ works best when paired with our industry-leading grit separation systems like the HeadCell® and Grit King® to provide a complete advanced grit washing and dewatering system. 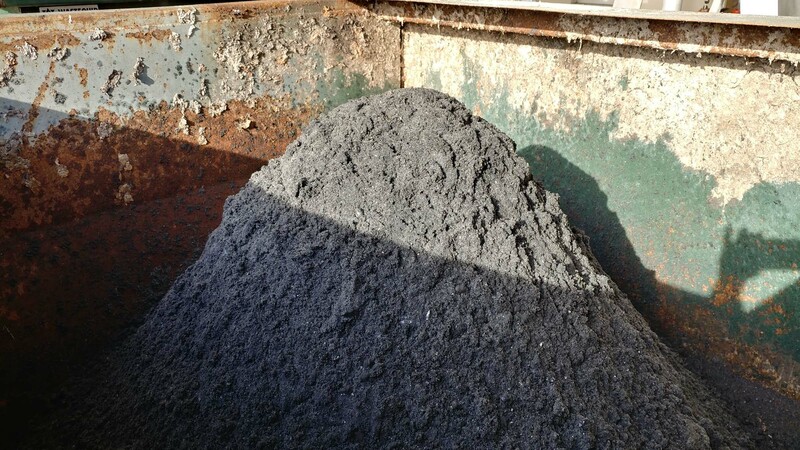 A grit removal system is only as strong as its weakest link; for this reason, we focus on providing complete grit systems that output a cleaned, dewatered product that is ready for cost-effective disposal. The Hydro GritCleanse™ optimized grit washing and dewatering process allows plants to significantly reduce volatile solids and output grit with less than 5% VS.
Each part of our grit removal process is designed to complement and capitalize on the performance of the other elements. This allows us to simplify design complexity, expedite installation and guarantee performance with single supplier accountability. The Hydro Grit Cleanse™ is backed by 35 years of experience providing industry-leading grit removal performance coupled with single supplier system accountability using our Advanced Grit Management® approach to grit system design. The result is an optimized fluidized bed grit washing system designed for easy maintenance and operation. Download the Hydro GritCleanse™ brochure here. Reducing organic material in captured grit reduces volume, weight, water content and odors. Cleaner grit retains less moisture and allows it to drain away. This results in less material that needs to be landfilled – significantly reducing disposal fees, hauling and handling fees and the resources needed to deal with it. 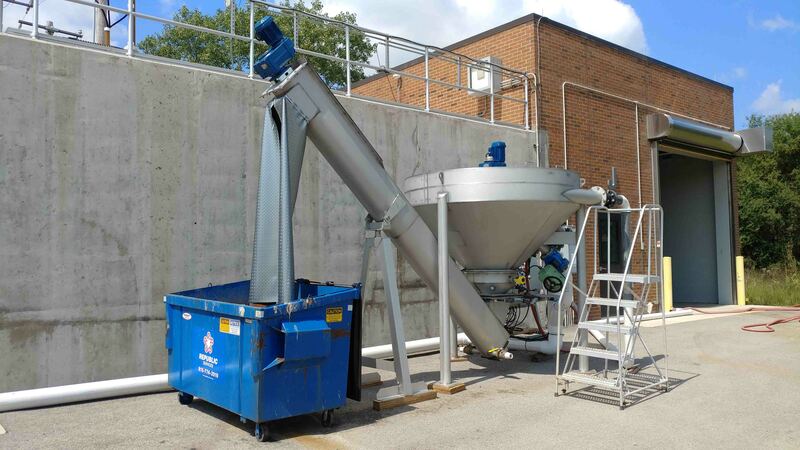 Bundled grit separation, washing, and dewatering from a single manufacturer simplifies maintenance and operational questions and provides a single point of contact to ensure that the entire grit removal process can protect your plant. A single supplier eliminates finger pointing with different manufacturers blaming the others for any problems. Hydro International provides complete grit removal systems with no weak links. A single supplier ensures that your grit removal system is always operating at peak efficiency with optimized performance. Disposing of grit is usually performed as a batch process. Grit is often left in open air dumpsters until enough is collected to warrant disposal. High organic content grit can lead to significant odor issues and an unpleasant environment for operators. The Hydro GritCleanse™ system outputs grit that has less than 5% Volatile Solids. Additionally, the Hydro GritCleanse™ is fully enclosed, further reducing odor issues. The Hydro GritCleanse™ is the only fluidized bed grit washing system specifically designed to work with the industry’s best performing advanced grit separation systems the HeadCell® and Grit King® and is designed to fully capitalize on their phenomenal performance. When a Hydro GritCleanse™ system is paired with our grit separation technology we can guarantee entire system grit removal performance. All stainless-steel construction and heavy-duty design ensures durability even in outdoor operation. The Hydro GritCleanse™ uses a shafted screw design with an external lower bearing. Unlike classifiers with shaftless screws there is no need for liners or steel wear bars that often need to be cut out to be replaced, requiring a complete disassembly of the unit. Instead, the Hydro GritCleanse™ is equipped with a long lasting 4 bolt lower bearing that can be accessed and serviced from the outside of the trough saving both money and downtime. Shafted screw design reduces wear and eliminates the need to replace wear bars or liners. The dewatering screw pivots to allow easy access for maintenance. Rinse water is injected via nozzles which are accessible externally. Other systems use neoprene membranes to introduce rinse water, but membranes are subject to fouling when using non-potable water. The membranes are also typically stacked within the screw/clarifier assembly which requires complete disassembly for maintenance. By feeding the clarifier at the tangent the Hydro GritCleanse™ immediately puts the grit in contact with the clarifier surface and establishes a rotary flow pattern. Grit is caught in the boundary layer as it settles to the bottom of the unit into the gently agitated fluidized bed. Washers that feed at the clarifier center force the grit particles to travel a significant distance to reach the clarifier surface. This allows more opportunity for finer/slower settling grit to carry out with the effluent. Flow is introduced tangentially into the conical clarifier, thereby creating a rotary flow pattern that forces grit into the low velocity boundary layer located at the inside wall of the vessel. The structured, laminar flow pattern and interior baffle allow retention of finer particles than conventional grit washing solutions. Once the grit is caught in this boundary layer it is decelerated and settles to the bottom of the unit into the gently agitated fluidized bed. The physical forces prevalent in this bed cause a separation by density which results in heavier particles, such as grit to fall to the bottom of the bed while the lighter (lower specific gravity) organic materials remain in suspension at the top of the bed. 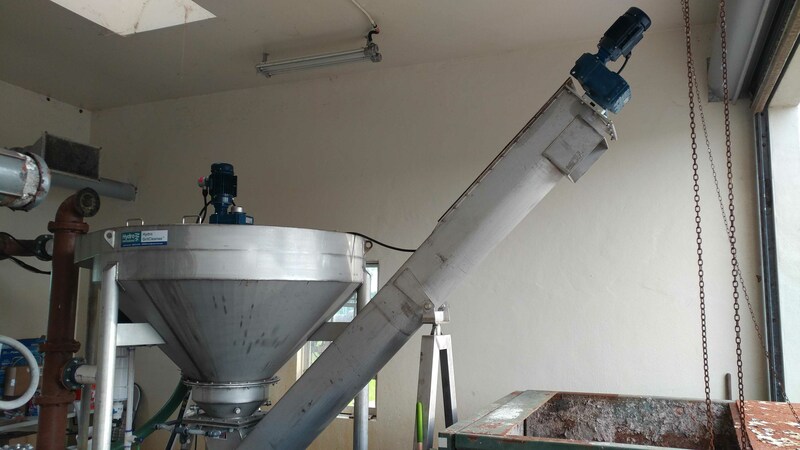 Washing occurs in the fluidized bed as organic material attached to the grit particles is scrubbed away due to friction between particles, and the higher density cleaned sand descends to the bottom. Once the grit has been captured, organic particles flow out of the unit for additional treatment downstream of the Hydro GritCleanse™ system. The cleaned grit is then intermittently discharged and dewatered by means of a screw. Learn more about the phenomenal performance of the Hydro GritCleanse™.